I haven’t lived in a house with a fireplace since I was 10 and have sorely missed having one. There’s something about nights (winter or summer, outdoors or indoors) spent curled around a fire that can be so cozy and relaxing. Having this luxury in itself is great, but there’s an edible treat that makes it even better: the s’more. Mmm, s’mores. What’s not to love? 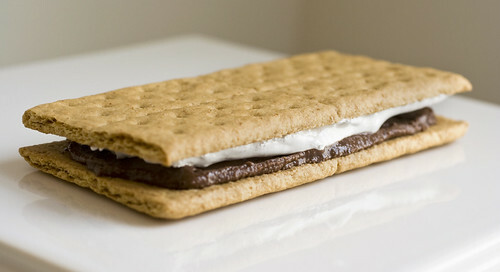 Warm, toasted gooey marshmallow atop melting chocolate, all held together by crunchy graham crackers. Yum. Luckily, they are still easy enough to make without a large fire (stovetop-charred marshmallows? ), but when you want a tasty snack on the double, without the flames and scorching-hot skewers, spreadable chocolate and marshmallow come in particularly handy. Enter Justin’s Nut Butters. Justin’s recently sent me a sweet sampler pack that included their too-cute-to-eat-but-I’m-going-to-eat-them-anyway Squeeze Packs, along with their NEW* Organic Peanut Butter Cups. Since they sent so many goodies, I’m going to divvy them up into multiple posts. For today, we’re going to concentrate on the Natural Chocolate Hazelnut Butter. Having prior experience with other chocolate hazelnut spreads (namely, Askinosie Chocolate Hazelnut Spread and Nutella), I wondered how Justin’s would stack up. I took a bite of their version and to my surprise it was really good and very different from the others. It’s textured and (being appropriately named) is more of a chocolatey “nut butter” while Askinosie’s is the reverse – more of a nutty chocolate spread. They sound similar by name but it’s kind of like comparing apples and oranges (if apples and oranges were a little higher in calories). If you want a deep, dark, smooth-as-butter chocolate-heavy version, go with the Askinosie. If you want something a bit nuttier and sweeter but not in Nutella’s league of head-floating sweetness, try Justin’s. Of course for any taste mood swing you may have, you might want to get all of them. :) What’s the boy scout motto? “Always prepared?” They were referring to chocolate hazelnut spread when they came up with that, right? 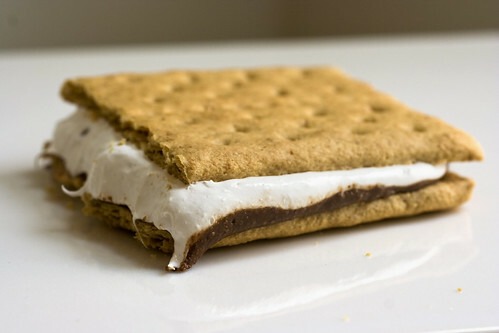 Anyway, back to the s’more. I tasted the spread on it’s own and then whipped up my little afternoon snack (graham crackers + Justin’s Chocolate Hazelnut Spread + marshmallow fluff). I grew up making s’mores with the usual Milk Chocolate Hershey Bar, but using this spread gives you the extra added bonus of hazelnut flavor. So maybe it doesn’t have the char of the freshly burnt ‘mallows, but the extra nutty flavor makes up for it. *Incidentally, if you’re looking for a tasty treat on-the-go and don’t have time for the quicky s’more, Justin’s handy new Organic Peanut Butter Cups would also do the trick. For anyone who loves peanut butter cups, but desires a more natural, less artificial option, they’re worth a try. Check out Justin’s Nut Butters for lots of nut-buttery-treats!